Tell your friends and family to get those palm fronds ready because this Emperess is not going to be walking on a normal floor. No way! You're an empress and they must treat you as such, at least when you wear this ensemble! We think you're going to be a great leader at this costumed event. Your fabulous goblet will continuously be filled with the loveliest wines. Maybe you can even get someone to invite you to a luxurious bathhouse. Someone needs to have a fancy bath house hidden away, right? People might wonder why you deserve such treatment until they see your costume, that is. The dress has a clean white base layer with a medallion on each sleeve strap. The red fabric is draped over one side of the chest and over one side of the skirt. It's belted with a black fabric with gold embroidery that matches the gold and black armbands and the border around the hem. 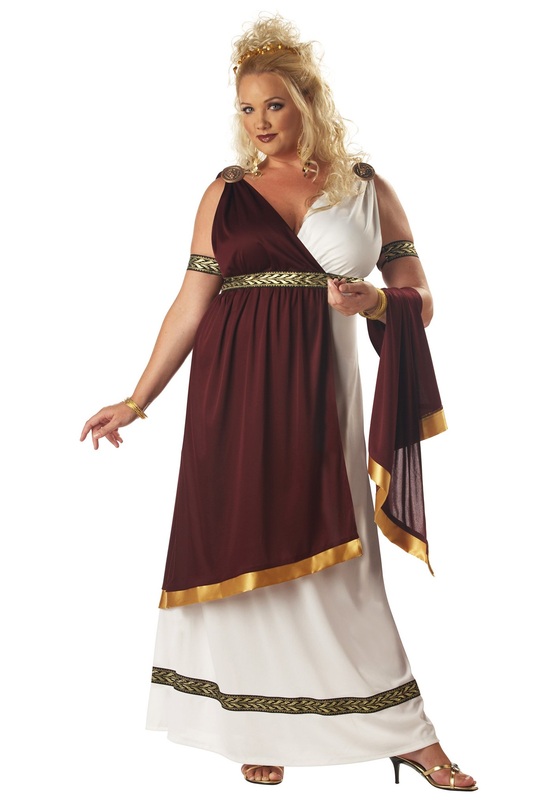 Pair this costume with a pair of our Egyptian sandals and a lovely headdress to make this look complete. Once they see your look your servants (aka: friends) won't mind bowing down to you in this Plus Size Roman Empress Costume! And when you pair it with one of our Roman warrior costumes you can enjoy being protected as well as worshiped. So, get your decrees ready, your power will be at its height when you're wearing this ensemble so you need to make it count. So, tell those folks to make weigh, the Empress is on her way! While it is plus size, it is very small around the waist. Almost no breathing room at all, especially if you live in a cold climate (like I do) and have to wear layers. It's also very long. I'm only 5'2" and I had to lift and carry it every time I walked anywhere. The medalions are only fitted with a safety pin that can come off completely if you're not paying attention. The arm bands are not made for plus size women's arms. They bunch and roll. And of course the white section is see through so wear a slip or something underneath if you don't have to worry about staying warm. I didn't take any pictures of myself in it because I looked like a pregnant empress with the belt so high and tight. I won't be wearing it again and will donate it to Goodwill.